It's time for another installment of Tasty Tuesday! 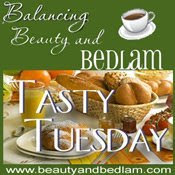 Join the party over at Jen's spot at Balancing Beauty and Bedlam for more fun recipes! My mom is an elementary school teacher. This means that she endures much suffering and torture (at a private school!) from late August to early June, but then she gets a couple of months off. She likes to spend her summer months wandering around her enormous, cavernous home thinking of projects she could be doing and playing with her grandbabies instead. Imagine my surprise when she announced over the phone today that not only did she clean out a big chunk of the basement, but she had a little something for moi! You see, my mom knows of my obsessively fanatical addiction fondness for caffeine. When you are a mother to a child whose energy rivals that of a Tasmanian Devil, you have to be at the top of your game. To make it through the day without passing out in the checkout line at Target, I rely on my good friends at Starbucks. The problem with Starbucks is that they know they have you hooked on their $5 coffee, and they don't care. No, they don't care one little bit! So thanks to my mom, I am ready to fight back! I remember my dad purchasing it back in the early to mid-90s. It was before Friends made sitting around drinking lattes the height of coolness. My mom was highly unimpressed, and the poor old Braun probably got used twice. Lucky for me, my mom lives in a big, giant house with lots of storage space and she forgot all about Mr. Braun until today. I cleaned up all the parts, and I had to search for 30 minutes online before I think I found the manual on a Canadian website. Go Canada! It wouldn't be Tasty Tuesday without a recipe or two, so I did a little research and found a great iced mocha recipe for those of you who aren't lucky enough to have a free, 15 year old, hand-me-down espresso machine. If mine doesn't work, then I might be using this recipe too! These look like they'd be great for a girls' morning get-together. Let the kids play on the swingset, dine on goldfish crackers, and sip on juice boxes while you and a friend enjoy the real deal! 1.Pour coffee into ice cube tray. Freeze until solid, or overnight. 2.In a blender, combine coffee ice cubes, milk, chocolate syrup and sugar. Blend until smooth. Pour into glasses and serve. Of course, you'll need something to serve with your iced mocha! 1.Preheat the oven to 350 degrees F (175 degrees C). Grease a 12 cup muffin tin, or line with paper liners. 2.In a medium bowl, stir together 2 cups flour, 3/4 cup white sugar, baking powder and salt. In a separate bowl, whisk together the vegetable oil, orange juice, buttermilk, vanilla, and eggs. Pour the wet ingredients into the dry, and mix until just blended. Some lumps are okay. 3.Fill the prepared muffin cups halfway with the batter. Combine the brown sugar, and 1 1/2 teaspoons cinnamon; sprinkle about 1/2 teaspoon of the mixture onto each half-full muffin cup. Spoon batter over the cinnamon mixture so that the muffin cups are 2/3 full. In a small bowl, mix together the remaining 1/4 cup flour, 1/4 cup white sugar, 1 1/2 teaspoons cinnamon, and the butter to make a crumbly mixture. Sprinkle this generously over the tops of the muffin batter. 4.Bake for 20 to 22 minutes in the preheated oven, until a toothpick inserted into the crown of a muffin, comes out clean. Cool in the pan, over a wire rack. Could this BE any more delicious (said in my best Chandler Bing voice)? I can't believe that your mom forgot about her espresso machine. Lucky you for getting it! Oooh, lucky girl! :) Sounds divine on a warm morning like this!! Oh my. Those muffins look simply scrumptious! And I even have all the ingredients-yay! Aw yes, like me you have found a way to unhinge the grasp that Starbucks had on you! I myself found a way to do that recently, and boy do the savings rack up when you're not spending $20-$25 a week on their stuff! Congratulations! It's nice to meet you via SITS! You had me at the iced mocha, and then you talk about the muffins?! LOL Both sound great! Ok, so I am a Starbucks addict! Thank you so so much for posting this! You will be saving me $$ :) Cant wait to try this!! Mmmm...those muffins sound and LOOK delish! I like the idea of cinnamon and orange. I love streusal on anything and on orange muffins, it sounds great. Ah, Starbucks. *wistful sigh* Since the economy went sour, I've not spent a single penny on that stuff. Instead, I drink Folgers. With my pinky in the air as I sip. MMMmmmmm that looks sooo good, I could totally go for a coffee right about now. Yumm.